Music abounds here at the American Treasure Tour, from player piano and orchestrion paper rolls to 8-track cassettes to record albums of all speeds. the 45 r.p.m. record was introduced in in 1949 on which two songs were presented - one on either side. We love 45's here, and prove it by having them displayed throughout our Music Room. Today, we honor a song from 1968, "A Place in the Sun," performed by Diana Ross & The Supremes AND The Temptations. Yes, ladies and gentlemen, two great bands performing together to promote a television program that aired highlighting them both. 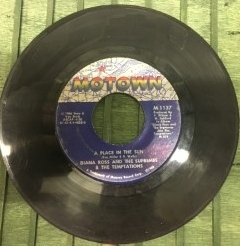 The album Diana Ross & The Supremes Join The Temptations proved to be a big hit for Motown Records, despite (or because) all of the songs were covers of other popular musicians - "A Place In the Sun" was written by Stevie Wonder.